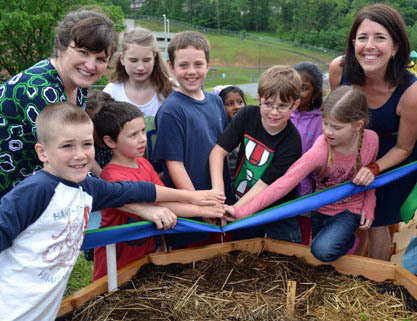 Since Morgantown’s North School launched their international garden program in 2012, teachers have integrated plant science into the academic program. At Morgantown’s North School, students plant an international garden that includes 35 raised beds with plants from countries they study. They built them with the help of a Lowe’s Toolbox grant. They raise food year-round and use their gardens as a math and science platform. The curriculum was created through a partnership between WVU teacher ed program and the North School staff. Children perform pH tests on the soil and test the light, to see which raises the best vegetables, for instance. WVU faculty designed some of their projects, and many come from “Kids Gardening: Helping Young Minds Grow,” a field-tested, proven program of the National Gardening Association. http://www.kidsgardening.org. 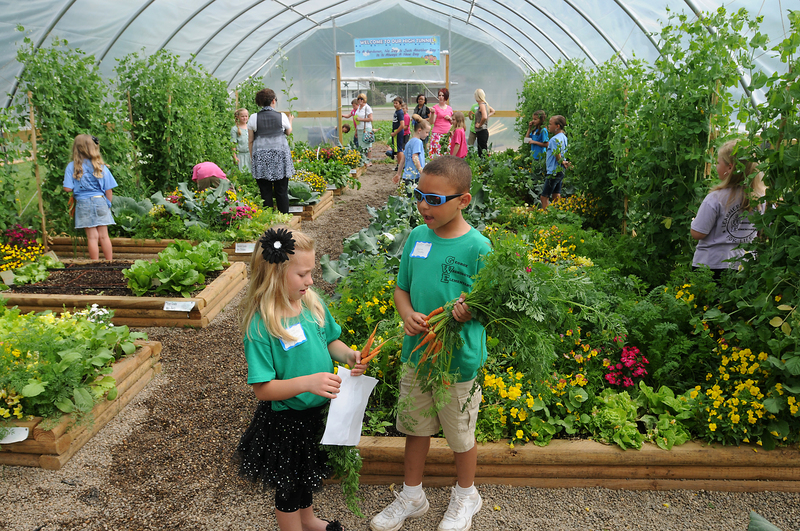 At George Washington Elementary in Eleanor, Putnam County, teachers illustrate classroom lessons with vegetables students are growing in the school’s high tunnel (hoop) greenhouse. They use the Junior Master Gardener Program. “Through this program, youth learn how to grow their own food, and it turns into a life skills situation, showing them where food comes from,” said Extension agent Chuck Talbott. “We’ve had kids sitting in a garden eating spinach like potato chips because they’d never seen it growing before.” Putnam County master gardeners volunteers keep the hightunnel program well-oiled. 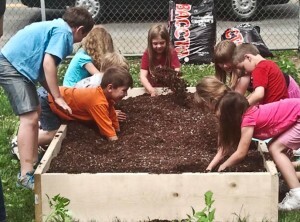 Wheeling kids dig into raised bed gardens during school workshops. 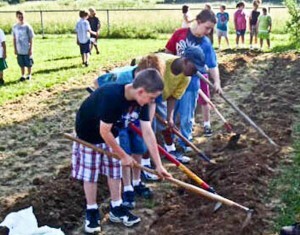 West Virginia School Garden Toolkit. This is the first thing you want to look at. It may have everything you need. Created by West Virginians for West Virginians. The new Farm to School Resource Kit, developed at Morgantown’s North School, is a fabulous resource. 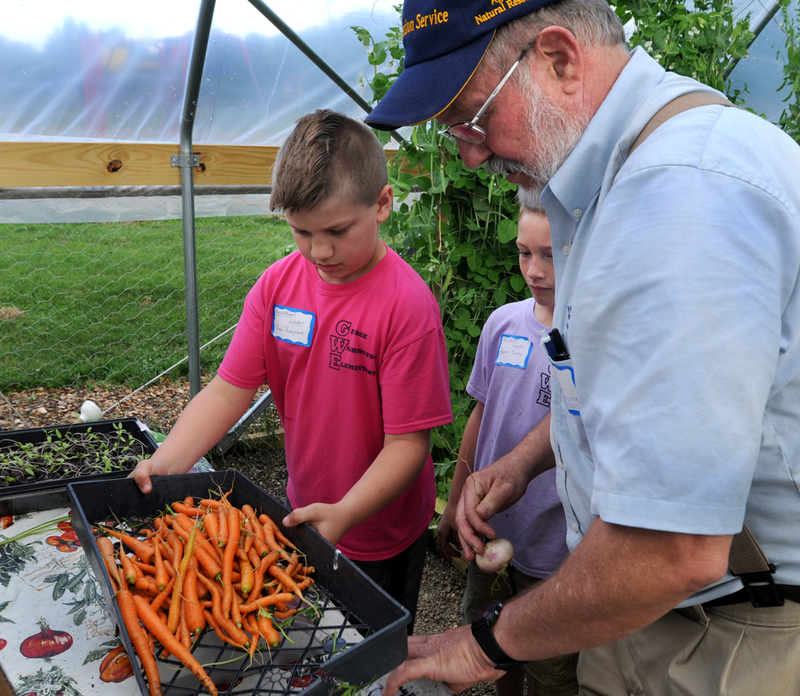 Free help and materials available through West Virginia’s Junior Master Gardeners curriculum teaches kids how to plant and grow food and flowers on a basic level. West Virginia State University Extension Service is the West Virginia headquarters for this national program. Their staff will come in and train school staff to use the curriculum and help a school write grant applications and will give them helpful materials. Read more at http://jmgkids.us/what-is-jmg . In West Virginia, e-mail: extension@wvstateu.edu or call West Virginia State University and ask for the Extension office. www.StartaGarden.org. This wonderful new national resource was created by a West Virginian! You absolutely want to look at it as you plan your garden. It helps you plan a growing experience in everything from a raised bed to a tin can or plastic cup! A must-see. The “Young Ag” page on the WV Dept. of Agriculture site. Full of good curriculum ideas. West Virginia Outdoor Classrooms facebook page is full of great ways you can move part of your day outdoors. Want create a high tunnel greenhouse like the one at George Washington Elementary? Look at this powerpoint presentation by WVU Extension agent Chuck Talbott. Click on the picture. Here is a powerpoint of pictures that leads you through the hightunnel creation process. Click on the photo at right. 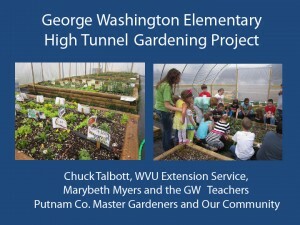 Created by WVU Extension agent Chuck Talbott, it shows the step-by-step creation of the George Washington Elementary High Tunnel in Putnam County. 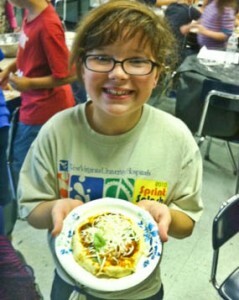 West Virginia school garden support network: Here’s a facebook page for the WV support network. Here is a wide variety of resources from School Nutrition.org. And you can subscribe FREE to Youth Gardening Gazette, published by the American Horticultural Society. Watch this West Virginia video: “Early education through growing gardens,” by the West Virginia Food and Farm Coalition’s Fresh Ideas in Action series, featuring West Virginia State University Extension Service. EarthBox in Our Schools: http://earthbox.com/videos. A variety of videos that provide tutorials on school gardening and show how teachers incorporated gardening into their schoolday. Ingredient: A Magazine for Kids Curious about Cooking: http://www.ingredientmag.com. Check out their sample issues and free resources. 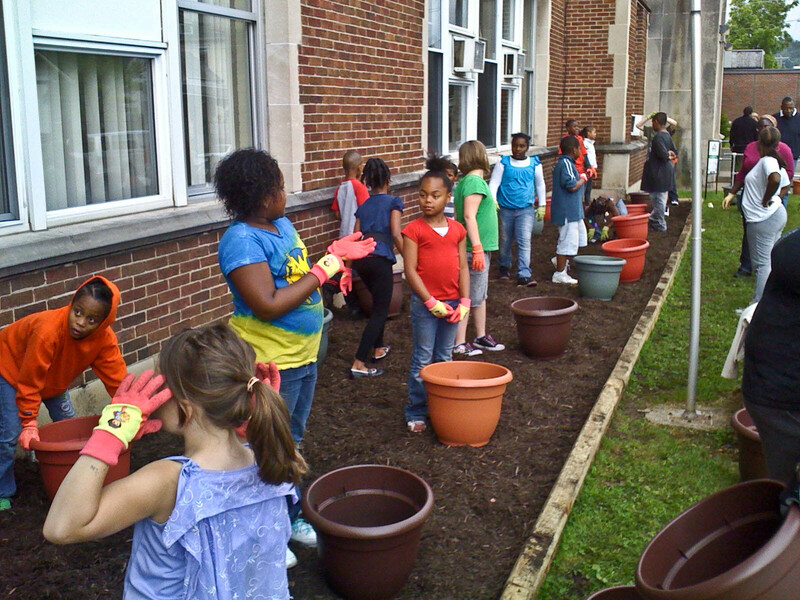 Charleston afterschool students learn now to garden in containers through workshops organized by Keys 4HealthyKids. Photo courtesy KEYS. 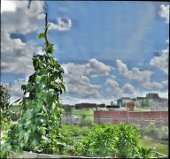 Need money /resources for a school / community garden program? Partner with your local WVU or WVSU Extension Service. They can help you get it going and keep it going (see photo on left). Make a list of other local groups (garden clubs, etc.) that could supply volunteers. www.kidsgardening.org Check it out! Packed with ideas, funding possibilities, and great examples. The Try This funding page includes numerous sources of funding for gardens, including the Lowe’s Toolbox for Education grant North School received. If you have signed up for Fuel Up to Play 60,( http://www.fueluptoplay60.com) you are eligible to apply for healthy lifestyle grants of up to $4,000 per year. The money must pay for something that will last, which could be raised beds or part of the cost of a high tunnel greenhouse. Try local fundraising. This is a great, affordable project for local firms to support, either with direct funding or in-kind contributions. Cut your costs by hooking up with local people certified as master gardeners. They have to do community service each year to keep their certification. Maybe they’d like to help with your project. You can find them by asking your extension agent to give you a list of them. Here are useful national funding source lists. Also see these Try This pages: $$ funding, high tunnel greenhouses, community gardening and farm to school . have connected the gardening program with their academic program.